It seems everyone has been getting their roast on before the last of the cold weather leaves us. As much as I am a complete Summer lover, there is something about the comfort food of Winter that makes me want to hold onto the cold for just a tiny bit longer. I decided I wanted to cook spatchcock recently. I’m not sure why I had this sudden desire, but having never cooked it before I felt like it was time to turn my hand to it so as to check it off the list of things I really should cook. While called spatchcock in Australia, it is more commonly known overseas as poussin or spring chicken. I have a feeling from a number of conversations with non-foodie friends that a few people may not realise that a spatchcock is really just a young chicken. It might take some of the mystery out of cooking it. A couple of weeks after making this Feta and Herb Stuffed Spatchcock dish, and with a backlog of posts that is starting to get as long as my arm (why is cooking and photographing Chew Town recipes so much easier than writing these posts?!?) I noticed one of my gorgeous friends, Anna over at The Littlest Anchovy, had posted a spatchcock recipe – she beat me to it. Anna and I often have similar foodie ideas at the same time and it is becoming rather uncanny (I’m convinced she has Italian blood in her ancestry even though she says she doesn’t) and while I’m delighted to share this recipe for Feta and Herb Stuffed Spatchcock with you, I would also love for you to visit Anna’s blog and see her Sunday Spatchcocks with Fragrant Butter and Honey – because being spoilt for recipe choices is always a good thing. In my recipe I use persian feta, lemon juice and wonderfully fragrant herbs and stuff this under the skin of the delightfully delicate spatchcocks before roasting. This way the flesh stays moist and tender while the outside gets crispy and each time you open the oven door you are greeted by a heady waft of roasting herbs and feta. In a bowl place persian feta and using a fork, work it until creamy. Add rosemary, oregano, lemon thyme and lemon juice and mix until well combined. Take each spatchcock and gently separate the skin from the flesh taking care not to tear the skin. Spoon the feta mixture into the space between the skin and flesh and ensure it is evenly distributed. Rub the skin of each spatchcock with 1 tablespoon of olive oil and season well with salt and pepper. Place both birds on a baking tray and roast until the chicken is cooked through and the skin is golden and crisp, about 45 minutes. Serve with smashed potatoes and steamed asparagus. Hi there. Chicken looks great, but I’m pretty sure that spatchock chicken means it’s split down the middle (butterflied) before cooking. Hi there, In Australia, poussin and spring chickens are referred to as Spatchcocks. You are also correct as the style of taking a full sized chicken and splitting it down the middle to flatten it is also called spatchcock. Aha!! After I commented I noticed you are in Sydney and did wonder if it was a regional difference (I’m an expat Brit living in New York with several friends in Sydney). Thanks for illuminating me! As an enthusiastic home cook and occasional professional food photographer, I’m really enjoying your site. Interesting! I know the cooking term spatchcock (cutting out the backbone of the poultry, or splitting it down the middle, then flattening out the bird to cook) but didn’t realize it was also the name of young chicken. I love the things I learn reading blogs! Anyway, your stuffed spatchcock looks lovely. Next time you might want to spatchcock your spatchcock. 😉 Just because, you know! Haha! I love it! Next time, I definitely will… and I’ll definitely give you a mention for the suggestion. Molto bene! Bellissimo! Love the use of feta under the skins and so much healthier than my butter arrangement. Thank you so much for the lovely shout-out! Those little birds look oh so beautiful! 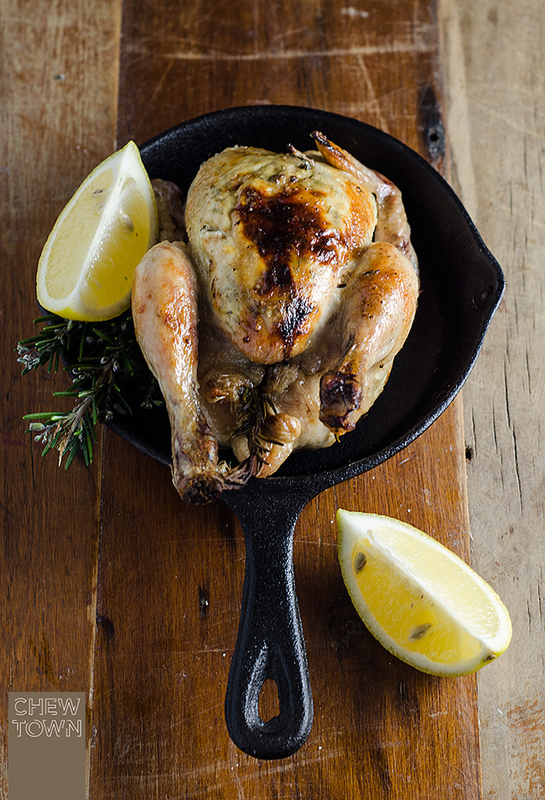 Love your food styling and photos.. but now that it’s lunch I want to carve one of those chooks right up!